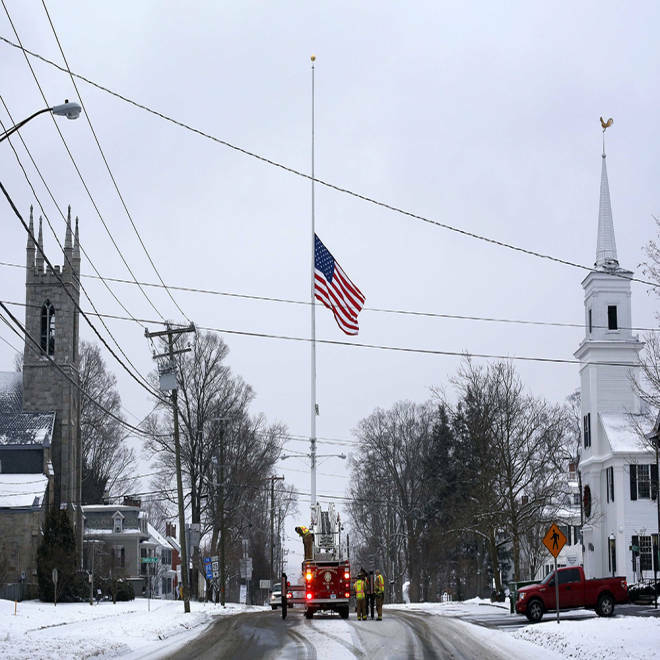 On the anniversary of the Sandy Hook Elementary School massacre, firefighters lower the town's flag on Main Street to half-staff in honor of the victims. Bells tolled 26 times in Newtown, Conn., on Saturday -- once for each of the victims who died a year ago at Sandy Hook Elementary School in a brutal, senseless massacre carried out by disturbed loner Adam Lanza. The bells rang began sounding at St. Rose of Lima Church in Newtown beginning at 9:30 a.m. — the moment the gunman shot his way into the school on Dec. 14, 2012, the Associated Press reported. Connecticut's governor had asked for houses of worship across the state to do the same, and flags were lowered to half-staff around Connecticut. At the White House, President Barack Obama and wife, Michelle, paused for a moment of silence in honor of the victims, standing at a wooden table in the Map Room before three tiers of 26 lighted candles. 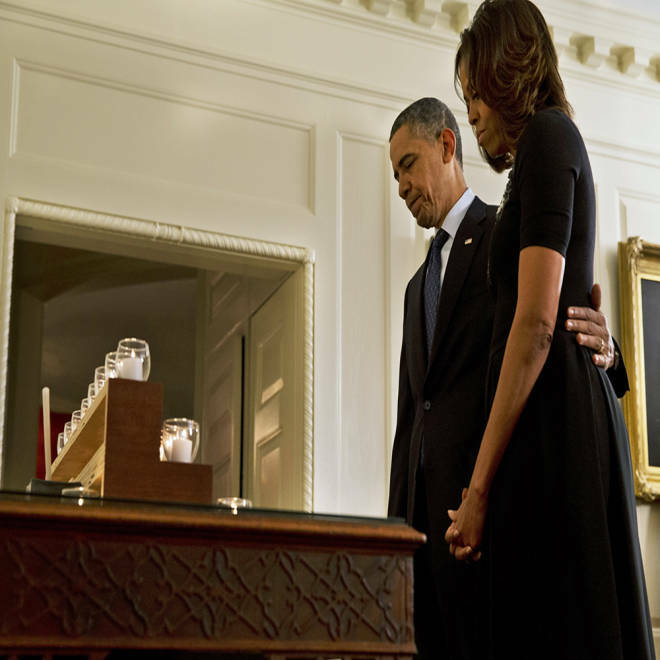 President Barack Obama and first lady Michelle Obama share a moment of silence in honor of the Newtown shooting victims on Saturday in the Map Room of the White House. Officials and many citizens of Newtown, still fatigued and traumatized, emphatically requested privacy, asking the American public and media stay away on the anniversary so that the families and friends of the victims could quietly mourn and reflect. "Newtown's ask of the world for the anniversary is to stay where you are and do acts of kindness and honor those we’ve lost," David Ackert, chairman of the Newtown Foundation and Newtown Action Alliance, told NBC Connecticut. Many Newtown residents were themselves staying away on the anniversary, including Neil Heslin, father of 6-year-old victim Jesse Lewis. He said that he planned to travel to New York on the anniversary to take part in a project honoring the victims, but also to avoid any spectacle that may encroach on the town. "I need to get out of Dodge," he said. Her passion was animals. So Catherine Hubbard's parents decided the best way to honor the school shooting victim was by helping the creatures she love so much. The Associated Press reported that Newtown looked every bit the classic New England town on Saturday, with snow falling and many homes decorated with Christmas lights. But it said reminders of the citizens' private grief were everywhere. "God bless the families," read a sign posted at one house in the green and white colors of the Sandy Hook school, and a church posted that it was "open for prayer." Andrew Snow, a 49-year-old mechanic who was drinking coffee at the general store with a friend, told the AP it was an especially difficult day. In his weekly radio address, hours before the White House memorial, President Obama said the nation hasn't done enough to make its communities safer by keeping dangerous people from getting guns and healing troubled minds. Gun restrictions backed by the president in response to the shooting faced stiff opposition and ultimately stalled in the Democrat-controlled Senate. Elsewhere, elected officials, clergy and various organizations across the country held solemn remembrances of the massacre -- with local candlelight vigils as well as demonstrations calling for stricter gun laws. In Ann Arbor, Mich., the "We Are Newton Remembrance Vigil" was held on the steps of the Federal Building. The event, which will include Mayor John Hieftje, is sponsored by a local branch of Organizing for Action, a nationwide nonprofit that supports the policy aims of the Obama administration, including tighter gun control laws. December 14 marks one year since the Sandy Hook Elementary School shooting, and some parents who lost their children that day are speaking out, aiming to make changes with the organization Sandy Hook Promise. NBC's Kate Snow reports. 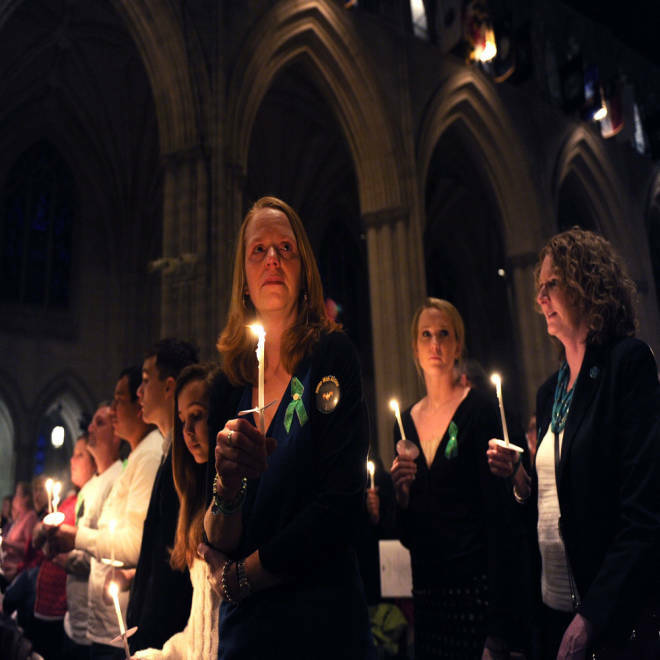 On the University of Pittsburgh campus in Pennsylvania, another branch of the organization hosted a “Remembering Newtown" candlelight vigil in recognition of the 20 children and six adults who were shot and killed by gunman Adam Lanza. Several event organizers across the northeast braced for winter weather and relocated their vigils indoors. Demand Action to End Gun Violence, a bipartisan coalition of U.S. mayors to stem the proliferation of illegal guns and to encourage stringent federal gun ownership legislation, will host a variety of events across the country. Its events are geared to honor the victims of the shooting Sandy Hook, as well as other victims of gun violence. On Thursday, family and friends of the Sandy Hook shooting victims traveled to Washington, D.C., to honor their loved ones through a solemn vigil and volunteer work. The group was joined by other gun violence victims from across the country. Miranda Pacchiana (C) of Newtown, Connecticut, holds a candle at the conclusion ofThe National Vigil for Victims of Gun Violence on December 12, 2013 at the National Cathedral in Washington, DC. During the vigil, the bell at the National Cathedral rang for three minutes to represent the lives claimed by firearms every year. Although remembrances of the shooting have been taking place over the past week, commemorations of the victims have occurred all year long. There is, for example, The Sandy Ground Project: Where Angels Play, which built 26 playgrounds in areas leveled by Hurricane Sandy, each named after one of the Sandy Hook victims, WVIT reported. There is also the Newtown Documentation Project, which sought to preserve the thousands of letters and handmade gifts that have poured into the town in the past year. NBC News' Miranda Leitsinger contributed to this report.